We left Walt Disney World and went to the beach. Every year since I've known her, my sister in law comes down to New Smyra, FL with her family. And they have continued the tradition. I've always wanted to see this haven, their retreat, that charges them all up for the rest of the year. So we crashed at a fairly cheap hotel we found online, that was supposed to be about 25 minutes from them. It seemed close enough. It said Rodeway Inn by the Beach in Daytona. It was 60$ a night, 70 with the rollaway. And turns out, it was ON the Beach. Literally. On the Beach! We were a hundred yards from the beach. I could see staying here for a while, we had a little kitchen, full size fridge, and it was great. We could hear it, and smell it when we checked in, but it was dark. All I'd been able to say to the kids was "See that darkness? That's the ocean." As we drifted off, I decided I wanted to get up early, and try to go out and see the sunrise. The last time I slept on the East Coast, wherein it was theoretically possible to watch the sunrise, I was 10, and our family was having a vacation in Sea Isle City, NJ. At the ripe age of 10, I did not care if I got up to watch the sun rise, or at least I don't think I did. I don't remember doing it. I was young and stupid. Well, I cared now! So I set the alarm clock for 6 am, and got up and padded out to the beach. There was no one around, our hotel was literally on the beach, we had our own beach access. I only saw the occasional jogger and a truck labeled Turtle Patrol. I know there are a lot of photos here, and though I did crop them, the colors that nature provided need no other enhancement. So they are just cropped and watermarked, that's all I did to them. This was the best day for photography. It was so early, at just before 6 am, I could still see the moon out, as the sky was getting lighter. I was up so early, that I didn't even get my coffee. Then the sun peeped up in the distance behind as the birds flying around. Even though the sky was half covered in clouds, I still saw a Beautiful sunrise. I couldn't resist dipping my tootsies in the water. It was just the right level of refreshing. I did get my happy pajama pants wet when I wasn't paying enough attention and got splashed by a wave. The waves were starting to pick up a little bit here and there. And it got Really Gorgeous out. This was a flower opening up as I went back inside. It was making me wish I'd brought out my sunglasses. Like I said, Really Gorgeous. I was content to go get my cup of coffee, and wake a couple sweetboys. After we got up, and dressed, I made the boys come out to the beach. The big ones didn't want to. I said, We are 100 feet from the beach, you have to come dip your toes in. They griped and griped, until I Actually got them out there. Then they started to smile, run, laugh, and then it occurred to them, they hadn't put their suits on. We'd done that on purpose, as we were packing up, then going down to Amy's, to swim. But once I got them to the beach, they realized how fun it was, and that was just with dipping our toes. Some birds taking off as the boys came invading. Now, this is my new happy place. All my sweetboys on the beach in Daytona. Jacob was not a fan of the beach. Fair enough, it was his first visit. Chris likes to take pictures of me taking pictures of him. Selfie with my Sams. He was probably having the most fun dipping in his tootsies. After our morning adventure at the beach, we packed up and drove to Ryan and Amy's condo in New Smyrna. The whole time we were asking, where's old Symrna? Ha Ha. It was about 20 minutes from our hotel, and the kids bugged us the whole way, alternating between wanting to swim, and wanting to eat. As soon as we got there, they were amazed by the beautiful ocean views. And they insisted that we go swimming. It had also gotten cloudy, so I didn't worry as much about sunburns as we would have when we'd gone to the beach earlier. When I was conceiving this idea, stopping at the beach, I just wanted to get pictures of the kids swimming together. But they all took off, so excited to play. And I wanted to join them. So I didn't take as many pictures as I'd have liked. And really, being at the beach with 3 iffy swimmers required both of us parents to actually be present with them. I did get to go out and swim with the girls, we did some wave jumping, which was fun. The water temperature was just right. The littles had fun playing in the sand. Jeremiah demanded a hole be dug in the wet sand. Jacob didn't want to be in the sand, but was pretty content with Daddy building castles. Chris and Sam had fun just splish splashing. Remember how I mentioned that I saw a truck in the morning that said Turtle Patrol. According to Amy, we are in prime Green Turtle nesting season, and since all sea turtles are endangered, the turtle patrol block off the obvious nest sites, and then cruises around in the early hours trying to check and make sure no baby turtles get lost and miss their chance to get to the ocean. Or they want to be there to block off the nests to protect them. They make everyone turn off the lights that could be seen by the beach so as to not confuse them and have them head the wrong way. Apparently they do it from April to October. I loved seeing this. It gives me hope for the future of sea turtles. Meanwhile, after we swam for an hour or two, we went upstairs for lunch. It was almost 2, and we were all hungry. Italian leftovers from a couple restaurants we drove by on our way in. Yum-o! If their leftovers were that good, the originals have to be Awesome. So after lunch, I stepped out on the penthouse lanai, and took a few pictures. Can you see the turtle nest way down below? It's in the lower left hand corner. But the rest of the view is pretty awesome too. As we stood up there, the sun broke out the colors in the water. One of the other things I really enjoyed getting a great view of from up there was the pelicans. There's just something primal about them, maybe I watched Jurassic Park too many times, but I see pelicans and think of pteradactyls. Apparently, they love to just circle the same areas of the beach, around and around, diving down to get snacks. While Eric was in the water with Jacob, earlier, a pelican dove down not 50 feet away from him. It looked really close, but we were up on shore. Very brave. But I felt pretty brave getting out there and taking their picture. What I hadn't considered was that I did not put on sunscreen when I went outside again, and this time the sun was out. These two went up the beach and circled back around right for us. I snapped picture after picture as they came back towards me. They buzzed right over me, right into the sun shining bright over my head. This was the most awesome moment. There was another that circled around down below our level. The penthouse was on the 13th floor, so they were lower than us. Amy's Mom and I watched them go by. She thought birdwatching was as neat as I did. I got some really amazing pictures. But if I posted all of them here, you'd be looking until next year! This fella came back around a little higher than we were. Suddenly, as I was snapping pictures of his gliding, he shifted his head and shook, like something disagreed with him. As quickly as he'd stopped, he moved on. But it ended up being the oddest pelican picture I got all day. How could he still be in the air like that?! Anyway, after our pelican picture fest, it became clear that Jacob, and a couple other kids, were getting tired. So we packed up, and headed out. Our goal was to get out of Florida. That doesn't sound hard. Well, they were all exhausted, but the only one that slept was Jacob. The other two were content to watch their screens. It gave Eric and I some time to think, to Think about seafood. We wondered if we were near any really good seafood. There must be some somewhere since we are so close to the beach. So since we were about 2 hours from Jacksonville, we started considering it for a place to stop. Here's one good reason to have a fancy smart phone. Eric looked up where we could eat that might have some goodies. He found a place recommended, called Singleton's Seafood Shack from Diners, Drive Ins, and Dives. One of the comments said, if you like your seafood coming from a shack, this is the place! Another comment said the place looked like it was going to fall into the water, but isn't that where you want your fish? It's right on the river, and it's so fresh, you can see the fish boats parked right out back. 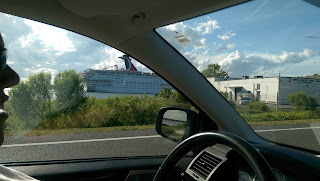 So as we were driving towards our destination, we spotted a giant cruise ship. The kids got a kick out of it, and suddenly, it was a race, would we catch the ship, would we see it by the ocean? What in the world is a cruise ship doing this far inland? Turns out we weren't that far inland. 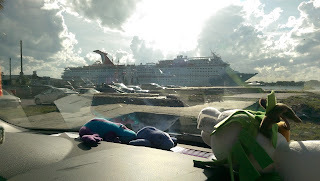 But we enjoyed chasing the cruise ship to our destination. The view as we parked the car. The Shack is on the left with all the cars parked, it was 5 pm on a Thursday, and it was crowded. We took it as a good sign. All three boys explore the odd old pier area as the ship passes. This place was old, in need of refurbishment. But they wanted to get as close as they could. We had to stop them from straying to far. But they were confident and curious, and so much different from when we'd started this adventure. Then we went in. There was a huge seafood counter, it all looked good and fresh. All the seating was huge tables. We decided to order some fairly local fair. So we started with an appetizer of gator tail, fried. They brought it out, and we made the boys all try some. Turns out they lovd it! (Tastes like chicken!) But they loved gator. Sam had three helpings! I got a fried sampler, but subbed out grilled scallops. I could have slurped up the scallops. I got some fresh fried clams, they just are no good, all rubbery and frozen in Indiana. They were Awesome, with a nice fresh snap. So good. And the batter was not too heavy. The seafood was great. The place was a mess, plywood fixes on top of plywood fixes. Our waitress said, "The Captain said, if it ain't broke don't fix it." They were clearly more concerned about serving good food. And it was good. It was a pile of stuff, with hush puppies, and all kinds of yumminess. It wasn't cheap, just because it looks like a hole in the wall, I thought it might be, but it wasn't, but myohmy, it was Good. This was Singleton's as we were leaving, with the sun going down on the St. John's River. And as the sun went down, it became clear that I had another monster sunburn. Turns out Jacksonville is a nifty town. Maybe next time we'll check it out for more than 2 hours. That was the Perfect stop for seafood for us, just what we needed. And as we drove off, Eric made us reservations for a hotel in Valdosta. It took us almost 3 hours to get there. The kids were toast, and so were we. We were so tired, we didn't even get on the internet that night!